Safety behaviors are actions carried out with the intention of preventing a feared catastrophe. In the short-term they often give a sense of relief, but in the long-term they prove unhelpful because they act as a barrier to new learning. 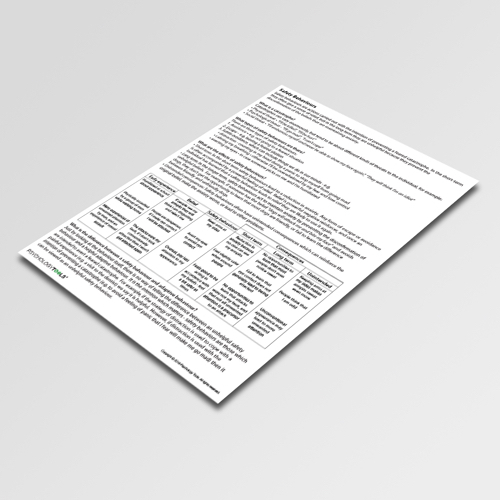 This CBT worksheet provides a clear and comprehensive explanation of safety behaviors and enables clients to have a strong understanding of the causes and consequences of safety behaviors so that they can be experimented with and relinquished. 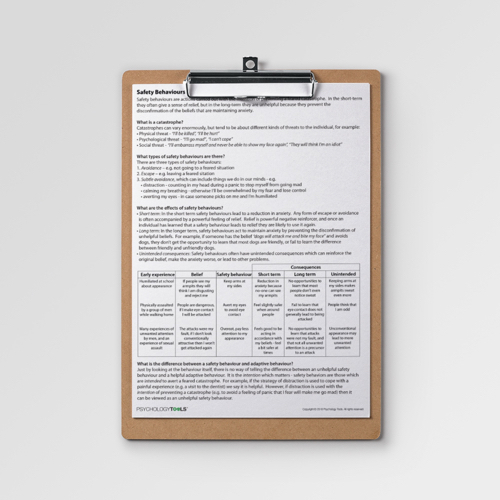 Safety-seeking behaviors are a response to a feared catastrophe. In situations that are perceived as dangerous people naturally act to keep themselves safe (and even have automatic evolved responses to promote safety – think ‘fight or flight’). Unfortunately, while safety behaviors can lead to a feeling of relief in the short term (and are thus reinforced), they have the effects of reinforcing beliefs about threat, lead to beliefs going unchallenged, or lead to other unintended consequences. 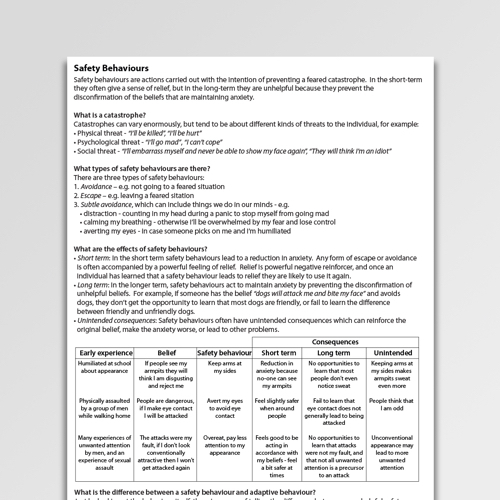 The Safety Behaviors worksheet is a CBT worksheet providing a clear and comprehensive explanation of safety behaviors. 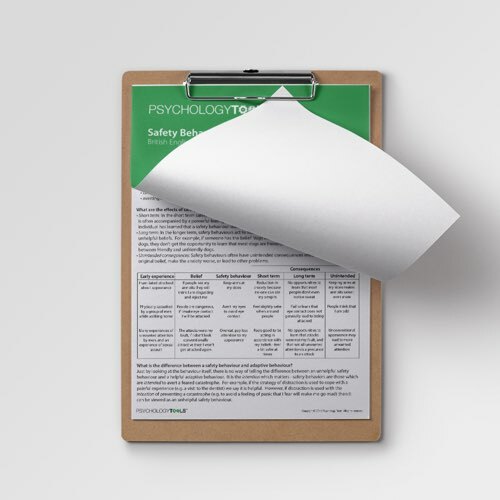 It is essential for clients to have a strong understanding of the causes and consequences of safety behaviors if they are to be experimented with and relinquished. Salkovskis, P. M. (1991). The importance of behaviour in the maintenance of anxiety and panic: a cognitive account. Behaviour Research and Therapy, 19(1), 6-19. Rachman, S., Radomsky, A. S., Shafran, R. (2008). Safety behaviour: A reconsideration. Behaviour Research and Therapy, 46(2), 163-173.